When I first heard about a Planet of the Apes prequel I thought...this is a really stupid idea. Turns out, not so much. Rise of the Planet of the Apes was amazing. When watching movies, I try to keep in mind I'll be blogging about it but, with this movie, I completely forgot about that- I forgot I was watching a movie. Everything about it was so engaging. I was sucked in immediately. As you might have guessed, we (by we I mean humans) did not come out looking good. We were vile or useless or both. 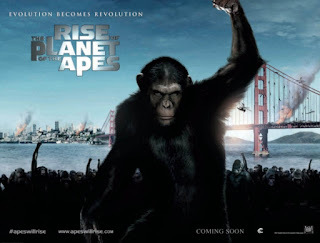 The movie is all about the apes, humans were simply there as seasoning. I felt so bad for Will played by James Franco though. He really was one of the few good human characters- all he wanted to do was save his father- but still, I cared far more about the apes. I loved Caesar- the main ape. His facial expressions were phenomenal. Andy Serkis, the man behind the ape, was spectacular. First Gollum, now Caesar...I am impressed. Caesar had it so hard I felt so bad for him. I wanted to cheer when he fought back and some people in the theater did. This one part, one of the best parts of the whole movie, made the entire theater, including me, gasp. I get excited just thinking about it but I will not tell you what happened, you have to see for yourself. Those who know me know I like to throw up the devil horns. I could not resist cause that scene rocked. I was stunned. The ending was sweet but not what I expected. In a movie called Rise of the Planet of the Apes, you'd expect to see how the apes took over. I was a bit disappointed it didn't go there but, I'm thinking there will be a Rise of the Planet of the Apes 2. Towards the end, the writers introduced another problem which wasn't resolved or even mentioned again but it was done in a way that said more- there will be a sequel and less- we introduced this and forgot about it. As a Harry Potter fan, I have to go here. Tom Felton, who played Draco Malfoy, was in it. Man he was vile. I don't mean his acting was bad because it wasn't. I mean he was written to be an unlikable character and man did he deliver. I'm not surprised. He did play Malfoy. This was the first time I'd seen one of the Harry Potter children in another movie but I had little trouble separating him from Malfoy. Overall, Rise of the Planet of the Apes is a spectacular movie with a well thought-out storyline, great acting and phenomenal visuals. This one I will be buying once it's available on iTunes. I've seen the original Planet of the Apes and am looking forward to seeing this. James Franco is the King of the Prequels because now he is starring in the new Wizard of Oz Prequel, "Oz The Great And Powerful." I didn't even know they were making a Wizard of Oz prequel. That ought to be interesting.